Seventeen-year-old Jet Black is a ninja. There's only one problem--she doesn't know it. Jet has never lived a so-called normal life. Raised by her single Japanese mother on a Navajo reservation in the Southwest, Jet's life was a constant litany of mysterious physical and mental training. For as long as Jet can remember, every Saturday night she and her mother played "the game" on the local mountain. But this time, Jet is fighting for her life. And at the end of the night, her mother dies and Jet finds herself an orphan--and in mortal danger. Fulfilling her mother's dying wish, Jet flies to Japan to live with her grandfather, where she discovers she is the only one who can protect a family treasure hidden in her ancestral land. She's terrified, but if Jet won't fight to protect her world, who will? Stalked by bounty hunters and desperately attracted with the man who's been sent to kill her, Jet must be strong enough to protect the treasure, preserve an ancient culture and save a sacred mountain from destruction. 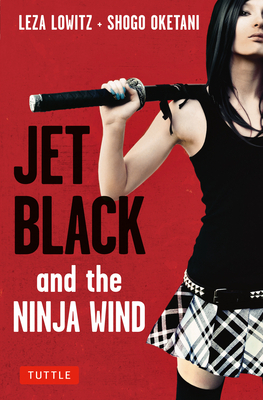 In Jet Black and the Ninja Wind, multiple award-winning author, poet and translator team Leza Lowitz and Shogo Oketani make their first foray into young adult fiction with a compulsively readable tale whose teenage heroine must discover if she can put the blade above the heart--or die trying. Award-winning multi-genre writer Leza Lowitz has published more than seventeen books, including the Amazon best-selling title, Yoga Poems. Her numerous awards include the PEN/Oakland Josephine Miles Poetry Award, a PEN Syndicated Fiction Award, grants from the NEA and NEH, and the Japan-U.S. Friendship Commission Prize for the Translation of Japanese Literature from Columbia University. Her writing has appeared in the Huffington Post, Shambhala Sun, Harpers, Best Buddhist Writing, the New York Times online, and on NPR's "The Sound of Writing." Shogo Oketani is a martial artist, editor, translator and author of the critically acclaimed middle grade novel J-Boys: Kazuo's World, Tokyo 1965. Together with Lowitz, he was honored with the Japan-U.S. Friendship Commission Prize for the Translation of Japanese Literature from Columbia University. Lowitz and Oketani live in Japan with their young son.